Inyuwa Nampitjinpa was among a group of Pintupi people who made their weary way into Ikuntji (Haasts Bluff) settlement just before Christmas 1956. They had walked hundreds of kilometres from west of the salt lake of Karrkurutintjinya (Lake Macdonald) to experience first-hand the supplies of food and water on offer at the settlement under the new government administration that had replaced the Lutheran missionaries. Nampitjinpa already had four children – three sons and a daughter – with her elderly husband Rartji Tjapangati. Nine years later, Rartji Tjapangati passed away in Papunya, and Nampitjinpa re-married. Her second husband was Tutuma Tjapangati, one of the most senior men in the founding group of artists painting at Papunya in 1971. Nampitjinpa and her family moved back to the Pintupi homelands community of Walungurru (Kintore) soon after its establishment in 1981. Tutuma Tjapangati was such a prolific and ebullient painter that it is doubtful Nampitjinpa would have been called upon to assist him, but when she took up painting her style owed much to his freewheeling, energetic approach. Nampitjinpa became involved with the Haasts Bluff/Kintore women’s painting project in 1994. 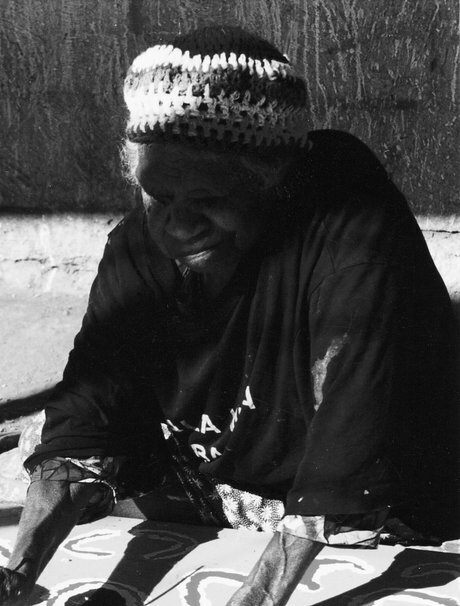 As an elder of the community, she assumed a supervisory role regarding the portrayal of women’s ceremonial subject matter, reminiscent of that taken by the senior men early on in the history of the Papunya movement. In 1997 Nampitjinpa had an operation to remove cataracts, which dramatically improved her eyesight, and she began painting regularly. Nampitjinpa’s paintings helped establish the signature style of senior women’s painting at Walungurru. Their dense, tactile surfaces, applied with a roughness and sheer volume of paint, exceeded those of any previous practitioners in the Desert style. As seen in Untitled (Pukunya) , 1999, her work retained only the most basic elements of traditional imagery, referencing rockholes, campsites and women’s utensils simplified to the point of abstraction. The large permanent water site of Punkilpirri, south west of Tjukula, was a recurrent subject. Until her death, the artist sustained a creative energy that resulted in her first solo exhibition at Gallery Gabrielle Pizzi, Melbourne, in June 1999. The paintings were still up on the walls of the gallery when Nampitjinpa passed away. 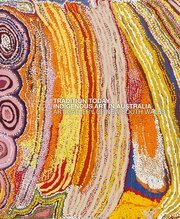 Her legacy remains in the paintings of her daughters, Walangkura Napanangka and the late Pirrmangka Napanangka.